A film festival isn’t just a place to appreciate top-notch contemporary cinematic works, but also an opportunity to uncover new talent and determine the future of cinema. 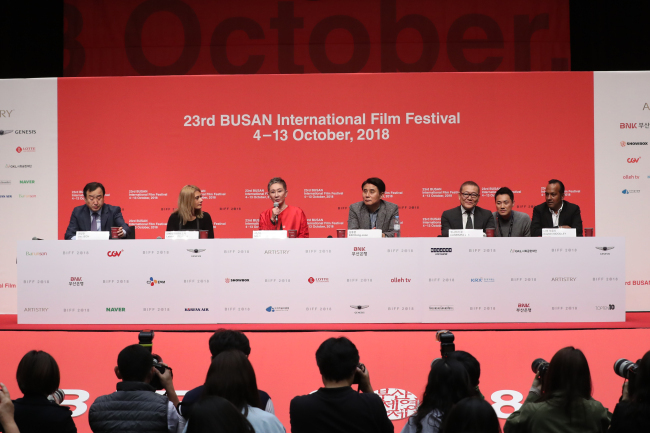 This is what the jurors for the New Current section of the Busan International Film Festival are looking to do, they vowed at a press conference in Busan on Friday, saying they were seeking directors with fresh perspectives. “Any industry -- film is no exception -- you must have new blood to prosper. We’re very interested to see new talents,” said Shi Nansun, a producer from Hong Kong who sits on the jury. She mentioned that she was glad to see the festival getting back to normal, referring to the past few years when the BIFF was hampered by audits, budget cuts, the forced resignation of key members, and boycotts by cinema groups. This was fallout from the 2014 screening of the controversial documentary “Diving Bell,” which was highly critical of then-President Park Geun-hye and her administration. “I think this is an opportunity for the BIFF, having gone through hardship, to find motivation for further development, a new start. … I will ensure that the expertise of each member of the jury is reflected in the outcome,” said director Kim Hong-jun, the head juror. Shi said a good film was one with a positive impact on the world, a point echoed by her fellow juror Labina Mitevska, an actor and producer from Macedonia. Mitevska said a good film was one with a striking emotional impact, prompting viewers to act. “We need more filmmakers who are not afraid to speak on the important issues,” she said. Mitevska expressed hopes that women would gain more representation in the film industry. “We should have equality, and female voices are not heard enough. I hear times are changing. I just hope that this comes fast,” she said, adding that changes were needed across the board -- for example, the presence of more female programmers. The jury also includes Nashen Moodley, director of the Sydney Film Festival, and Japanese actor Kunimura Jun. They will pick two of the 10 movies in the section, conferring awards and $30,000. Competing for the prizes are “Vanishing Days” by Zhu Xin, “Savage” by Cui Si Wei, “His Lost Name” by Hirose Nanako, “House of My Fathers” by Sivakumaran Suba, “Gold Carrier” by Touraj Aslani, “The Red Phallus” by Tashi Gyeltshen, “Clean Up” by Kwon Man-ki, “House of Hummingbirds” by Kim Bo-ra, “Aurora” by Bekzat Pirmatov and “Second Life” by Park Young-ju. The 23rd annual BIFF will run through Oct.13.